When Joseph Bonaparte was King of Spain, he was also, by default, the ruler of Mexico, or New Spain as it was called at the time. The Mexicans didn’t like him. Did they then offer Joseph a crown when he was in exile in the United States and they were seeking independence from Spain? In 1808, Napoleon imprisoned the Bourbon rulers of Spain, Ferdinand VII and his father Charles IV, and forced them to renounce all claims to the Spanish throne. 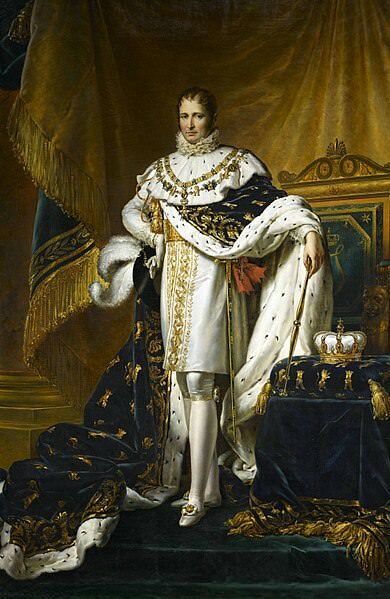 Napoleon then appointed his older brother Joseph Bonaparte as King of Spain. Although Spanish bureaucrats recognized the new monarch, the people of Spain rebelled against Joseph and the French occupation, resulting in the Peninsular War. Joseph’s full title was King of Spain and the Indies, the “Indies” being Spain’s overseas territories, including its colonies in the Americas. When news of the imprisonment of the Spanish monarch and the French invasion of Spain reached New Spain (Mexico), the colony’s leaders refused to recognize Joseph as king. They instead adhered to the junta, eventually based in Cádiz, which maintained a rebel government in the name of Ferdinand VII. The Peninsular War continued until 1814, during which time many native-born Spanish Americans took advantage of the chaos in the mother country to begin the quest for self-government. Mexico’s war of independence started in 1810. Neither side in the struggle displayed any love for Joseph Bonaparte, who was regarded as Napoleon’s puppet. The royalists remained loyal to Ferdinand VII, and the patriots (those seeking independence) wanted separation from Spain regardless of whether it was ruled by the Bourbons or the Bonapartes. In 1813, Joseph abdicated the Spanish throne and returned to France after being defeated by troops led by the Duke of Wellington at the Battle of Vitoria. In 1815, after Napoleon’s defeat at the Battle of Waterloo, Joseph fled to the United States. He settled in the Philadelphia area, splitting his time between that city and his estate called Point Breeze in Bordentown, New Jersey. A number of Napoleonic officers wound up in the United States, seeking to avoid persecution by the government of King Louis XVIII. These included Charles Lallemand and his brother Henri, Charles Lefebvre-Desnouettes, Antoine Rigaud, Emmanuel de Grouchy and Bertrand Clausel. They congregated in Philadelphia, where they socialized with each other, and with Joseph. In the summer of 1816, there were several newspaper reports about conversations regarding Joseph Bonaparte and the throne of Mexico. In an item datelined France, July 24, 1816, the Baltimore paper Niles’ Weekly Register reported private communications as follows. 1) A four-page covering letter, headed “Ultimatum,” which, among other things, implied that the author had been in communication with Joseph Bonaparte before. 2) A 23-page “Report,” addressed to “His Majesty, the King of Spain and the Indies, by his Faithful Subjects, the Citizens composing the Napoleonean Confederation.” This laid out a plan to arm and equip 900 men as “flankers of the Independent Troops of Mexico.” One hundred and fifty men had already signed up; the remaining 750 would be recruited from “the Missouri Territory, the Illinois Territory, the District of Columbia, the Michigan Territory, Tennessee, Kentucky and Ohio.” The new recruits would not be told the ultimate object of the enterprise, which was to “restore” Joseph Bonaparte as King of the Indies. Joseph was asked to contribute a total of 100,000 francs to the enterprise. If Your Majesty, as worthy of reigning as you are capable of viewing a crown in its just lights, and which is so much beneath your personal virtues, do not wish to engage in anything decisive as relates to Your Majesty, may you deign not to lose sight of the import and interests of your children, and of the people who look up to you as a second father! 4) A vocabulary of the Indians on the Mexican frontier, towards Santa Fe. 5) A list of the Indian tribes in northern Louisiana. Hyde de Neuville was convinced that the documents were genuine, and that the handwriting was that of Joseph Lakanal. Joseph Lakanal was born in Serres-sur-Arget, France on July 14, 1762. He studied theology and was ordained as a priest, but never served a parish. Instead he joined a Catholic teaching order. In 1792, Lakanal was elected to the National Convention, in which capacity he voted for the execution of King Louis XVI. He also became a member of the Committee of Public Instruction and proposed a fundamental reform of France’s education system, aimed at promoting republican morals. In 1795, he was elected to the Council of Five Hundred. After opposing Napoleon’s coup d’état of the 18th Brumaire, Lakanal was removed from office and retired to a professorship at the École Centrale at Paris. He became a member of the Institut National (later the Institut de France). 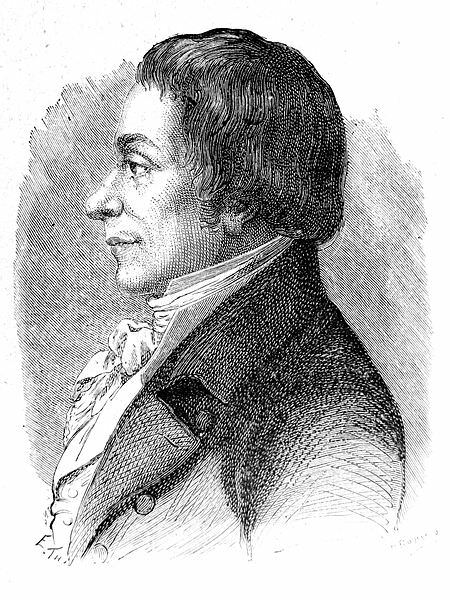 In 1809, he was made inspector of weights and measures for four French departments, with headquarters in Rouen. When the Bourbons returned to power in 1815, Lakanal was proscribed as a regicide. In early 1816, he sailed to the United States, accompanied by his wife Marie-Barbe François and their daughter Alexandrine. They settled on a farm in Gallatin County, Kentucky, on the Ohio River, nearly opposite the French settlement at Vevay, Indiana. In March 1817, the US Congress granted the French exiles land in Alabama, near the present site of Demopolis. This became known as the Vine and Olive Colony. Lakanal received 500 acres, but did not move to the colony. Hyde de Neuville took the Lakanal papers to John Quincy Adams, who had just become Secretary of State in President James Monroe’s administration. Adams compared the handwriting with that in other letters by Lakanal and agreed that they were the same. He brought the documents to the attention of President Monroe, who asked William Lee, formerly the secretary of the American legation in Paris and Consul General at Bordeaux, to find out whether there was anything to the purported plan. After talking to some of the Napoleonic exiles, Lee reported in late September that the Lallemand brothers were at the head of the scheme. He claimed they had already engaged 80 French officers and 1,000 men. The Mexican revolutionaries were reportedly eager for aid from the French exiles, and two wealthy Mexican mine owners had offered to provide funds and Mexican troops. A mercantile house in Charleston had offered money and two well-armed brigs, and some merchants in Philadelphia, New York and Boston were also involved. Charles Lallemand intended going up the Red River with his officers and about 400 men to form a base for collecting together all his forces. Although they had ample funds in Mexico, they were in want of funds in the United States. To obtain money, they planned to sell their shares in the Vine and Olive Colony to French merchants in Philadelphia. According to Lee, “all the French officers of distinction except the Lallemands” disapproved of the project. Lee also cleared Joseph Bonaparte of any involvement. Lee confronted Charles Lallemand in person. Lee later sent Adams another report which suggested that plans had changed and the expedition was actually destined for Peru. Charles Lallemand also took steps to derail any action against him. He sought an interview with Adams, in which he denied having any connection with any project contrary to the laws of the United States, and also denied knowing Lakanal. He had heard of some pretended letters from Lakanal to Joseph Bonaparte, but the latter had refused to receive them, which is why they were intercepted. The administration initiated an investigation into levies in the West, which failed to turn up evidence of the army described in the Lakanal papers. Monroe asked his friend Nicholas Biddle to keep an eye on the movements of the Lallemands in Philadelphia. In February 1818, Biddle wrote that the two brothers had sailed from New York with two or three officers for Mobile or New Orleans. About the same time, a vessel had left Philadelphia with nearly 150 persons on board, mainly Frenchmen, to join the Lallemands. Funds for this had been raised from the sale of lands from the Vine and Olive Colony. Biddle thought the expedition was heading for Spain’s possessions in South America. It was actually heading for Texas, which was then part of Mexico, to found a short-lived Bonapartist military colony called the Champ d’Asile. Neither Lakanal nor Joseph Bonaparte took part in this expedition. Instead Lakanal moved to New Orleans, where, in 1822, he became president of the Collège d’Orléans. The appointment was controversial. Many Creole families objected to having their sons educated by a regicide and married apostate priest. In July 1823, Lakanal resigned. He moved to Alabama, near Mobile. He returned to France in the mid-1830s, and died in Paris on February 14, 1845. Was Joseph Bonaparte offered the crown of Mexico? Did the Mexican patriots – who despised Joseph Bonaparte when he was King of Spain and the Indies – actually propose putting him on the throne of an independent Mexico? We may never know. As Louis Napoleon (born in 1808) was a child at the time, and living in Europe, not the United States, there is no way he could have witnessed this himself. It is possible that Francisco Xavier Mina, a Spanish revolutionist who visited the United States in 1816 in search of aid for his ill-fated 1817 invasion of Mexico, met with Joseph in Philadelphia in July of that year, thus giving rise to the 1816 newspaper reports. Spanish diplomatic officials reported that Mina had received money from Joseph, but there is no evidence that Mina’s expedition in support of the Mexican insurgents was undertaken to aid Joseph’s ascension to the throne. In September 1821, Mexico achieved its independence. On May 19, 1822, Agustín de Iturbide became the Emperor of Mexico. He ruled for only ten months. In 1861, under the rule of Napoleon III, France invaded Mexico and installed Maximilian (the son of Napoleon’s brother-in-law Archduke Franz Karl of Austria) as Emperor. In 1867, the Mexicans executed Maximilian. 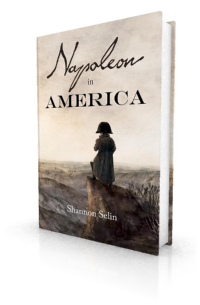 If you would like to imagine what might have happened if Napoleon had sought a crown in the Americas, read Napoleon in America. Niles’ Weekly Register (Baltimore, MD), September 21, 1816. Morning Chronicle (London, England), August 26, 1816. Cheltenham Chronicle (Cheltenham, England), September 5, 1816. Barry O’Meara, Napoleon in Exile; or A Voice from St. Helena, Vol. I (Philadelphia, 1822), p. 232. Charles Montholon, Récits de la Captivité de l’Empereur Napoléon à Sainte-Hélène, Vol. II (Paris, 1847), p. 97. Jesse S. Reeves, The Napoleonic Exiles in America: A Study in American Diplomatic History, 1815-1819 (Baltimore, 1905), pp. 51-60. Worthington Chauncey Ford, ed., Writings of John Quincy Adams, Vol. VI (New York, 1916) p. 196. Napoleon III, The Political and Historical Works of Louis Napoleon Bonaparte, Vol. II (London, 1852), p. 143. The quote originally appears in the French version of Louis Napoleon’s works: Ouevres de Louis-Napoléon Bonaparte, Vol. II (Paris, 1848), p. 330. It has been repeated in many subsequent books. I knew that French bonapartists immigrated in the US after the fall of the Empire but I recently discovered the story of Demopolis and the Vine and Olive colony after seeing an old Hollywood movie with John Wayne called The Fighting Kentuckian! Thanks, Marie-Noëlle. I’m glad you liked the article. I agree Joseph would not have been keen on being a king again. I will look for The Fighting Kentuckian – thanks for the tip! There’s some interesting commentary on the Vine and Olive angle in the movie here: https://alabamayesterdays.blogspot.com/2015/11/movies-with-alabama-connections-3.html. Thanks for the link! What a disappointment! A Hollywood movie which doesn’t tell the truth?!? The name says a lot! There were definitely Napoleonic officers at V&O, most notably General Charles Lefebvre-Desnouettes (https://shannonselin.com/2014/06/general-charles-lefebvre-desnouettes-unhappy-alabama/). But I gather the people who stayed and did the hard work were mainly planters from Haiti. Would probably still make a good film. Joseph was known in Spain as Pepe la botella, because of his drinking habits. I expect the nickname spread to the Indies as well. You’re right, Geoffrey. “Joe Bottle” was known as such in Mexico — an indication that he was not particularly high in local estimation. It is said that the unambitious character of Joseph, ex-king of Spain and the Indies, has been powerfully worked upon by a numerous body of generals, who regained their fame under Bonaparte, and who having fled to America for refuge, are uneasy at the state of inaction to which they have been reduced.